Last year Apple introduced the iPhone XS and one of its highlights was the built-in support for eSIM technology along with the regular SIM card. With companies like GigSky and Truphone, eSIM allows you to roam the world without worrying about standing in lines for local SIM cards or paying exorbitant fees to your local telcos for data roaming. 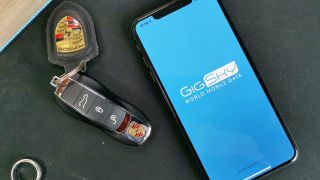 I was recently contacted by the folks at GigSky after they had read my article on the dual SIM capabilities of the iPhone XS. They asked me if I would be interested in testing their service and writing about it and offered a $100 credit for my usage. I’m always interested in checking out data solutions when travelling, which for me is usually once a month or more often, and I agreed. The first step was to download the GigSky app and register- a process that I think can be simplified. When you fire up the GigSky app for the first time, it almost immediately asks you for a plan you’d be interested in following which you enter your contact details for registration. I think this process should be reversed with you filling in your details first and then looking for a plan as it can confuse the end-user into thinking that they need to pay for a plan to register, which isn’t the case. Once you have registered you can use your credit card to top-up your account and purchase a plan for the region you’re planning on visiting, along with the duration of your plan. I was travelling within the Middle East and there is an option to buy a 1GB plan that lasts for 30 days which costs US$50. That plan is a bit on the pricey side when compared to Google Fi that I usually use while travelling which costs me $10 per GB anywhere in the world. However, I also need to pay Google a monthly fee of $20 for the service. So if you’re not a frequent flyer, GigSky can work out cheaper. Also worth considering are the regions you visit- for example, the 1GB plan for UK or US or most other countries I looked at is $20 and valid for 15 days. This makes GigSky reasonably affordable and, most likely, cheaper than what your local telco will charge you for roaming. One thing that GigSky doesn’t mention is network connectivity to the region you’re travelling to. For example, the country I was visiting only supported 3G connections and not LTE and had the GigSky representative not informed me of this, I might not have been able to connect as this requires you to turn LTE off manually. I recommend checking with GigSky support before you travel to clear any issues or confusion. That being said, while I was travelling, I had good data connection that was always working and I was happy with the service. Using the app, you can see how much data or days you're left with. I also got a notification when I consumed 50% of my plan. I do have a tip for anyone using this with their iPhone XS or XR which is to make sure you switch Data Roaming off before switching back to your local carrier for data, otherwise you could incur heavy costs without realizing. Apple needs to enable data-roaming setting per SIM card and not as a global on/off switch. But as far as GigSky is concerned, the service worked exactly as expected and is a great way to lower your roaming costs.